CHICAGO – The Hellenic Museum and Cultural Center, A National Institution, has just announced the receipt of a $100,000 pledge by Chicago businessman and philanthropist Chris P. Tomaras. This leadership gift is for the construction of the new, permanent home for the Hellenic Museum and Cultural Center (HMCC) that will be built on Museum property at the northeast corners of Van Buren and Halsted Streets. Mr. Tomaras recognizes the value that HMCC will offer Chicago and the community at large. He views the project as “a source of pride of the entire Hellenic Community as it projects to the world, through its activities, the concept of Hellenism and the values derived from it.” Currently, a number of public schools conduct field trips to the Hellenic Museum’s temporary home at 801 W. Adams where they learn more about ancient Greece and the impact it has left upon Western Civilization. HMCC has already raised over $5.5 million toward the construction of the four-story, 40,000 square foot building. The state of the art facility will include a number of galleries, an auditorium, a research library, a gift store, meeting rooms and parking. The building will be a striking beacon in the heart of Greektown that will be visible from both the Eisenhower and Kennedy expressways. The City of Chicago has offered their support and provided $3.5 million in TIF monies toward this endeavor. Other major donors include Dr. Mary Dochios Kamberos, the Alec Gianaras family, the Dr. James Elipas family, the Tom Livaditis family, Mr. Alex Spanos, the Hellenic League and an anonymous donor. Construction is expected to begin by next spring. Chris P. Tomaras is a successful businessman who has lived in Chicago since 1965. In the recent years he has been a supporter of the Greek communities both in the U.S. and in other countries. His work has been focused in promoting Heritage and Hellenism and in efforts for the preservation of the Hellenic Culture around the world. 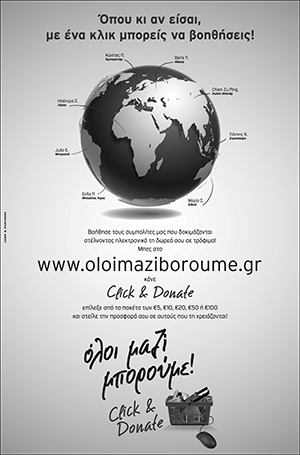 A philanthropist, Mr. Tomaras has made significant contributions to several Greek institutions that support Greek education and offer assistance and services to the various Greek communities. He is the founder of the PanHellenic Scholarship Foundation and has served in leadership positions in a number of civic, community and business organizations. The Hellenic Museum and Cultural Center is currently located on the fourth floor of the Greek Islands Building, 801 West Adams. Regular Gallery Hours are Monday through Friday, 10am – 4pm. The Museum will also be opened on Sunday, March 28 from 10am – 4pm. Regular exhibit admission is free to Members; $5 for non-members. Special fees may apply to programs. For more information call the Museum at 312.655.1234 or visit www.hellenicmuseum.org.